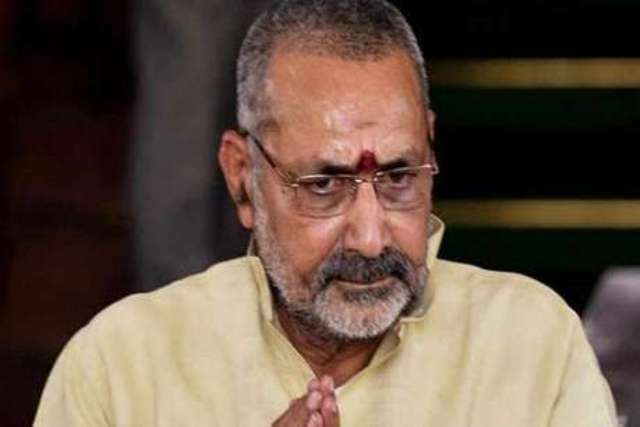 PATNA: In an embarrassment to the BJP, Union minister Giriraj Singh has been reluctant to contest from Begusarai seat in Bihar days after he was offered this seat. Singh who is Union Minister of State for Micro, Small and Medium Enterprises represents Nawada seat in the Lok Sabha but has now been shifted to neighbouring Begusarai under the seat-sharing arrangement. Singh will face in the poll arena JNU student union leader Kanhaiya Kumar who has been fielded by the CPI after the RJD-led Grand Alliance refused to allot this seat to the Left outfit. “I still have the love and affection of the people of Nawada. I will keep working for Nawada. I have developed a model for the rural economy here. For the government work, I will thank PM and CM of Bihar, that with their support the job no other minister could do, I did,” Singh told the republicworld.com on Monday. According to the minister, he had been promised ticket form this seat but later he was surprised to find that his seat had been given to the LJP led by another Union minister Ram Vilas Paswan. Singh’s supporters say no any minister from Bihar had their political constituencies changed except him. “This is the reason why he is unhappy,” said a minister’s supporter. However, insiders tell an altogether different story behind his reluctance to contest Begusarai seat. According to them, the minister is apprehensive of losing his seat in the fight between two leaders from the same Bhumihar community. Both Singh and Kanhaiya belong to this community. For the past several months, Kanhaiya has been visiting his home constituency and meeting the voters while the minister paid his attention to Nawada. This factor too has been worrying the minister.